In the Spring of 2007 I presented a public lecture on the politics of the category “religion” at the University of Calgary’s Department of Religious Studies. Following the lecture, as part of the usual question and answer session, a professor off to my right, seated back against the wall, asked me a seemingly simple question: “What are the truth conditions for your argument?” Sensing a little bit of a trap being laid for me—which, as we all know, is what most questions that follow academic papers are really all about—I replied that there were no such conditions since the paper’s topic, and its mode of delivery, were not concerned with truth, whatever that may or may not be; instead, the paper was concerned with utility and, by extension, with social affinity. “The paper was an exercise in persuasive rhetoric,” I recall responding, and therefore none of its claims were either true or false. Instead in that lecture I tried to persuade listeners that should they, for whatever reason, be interested in certain sorts of questions about how groups work to recreate themselves over time and place, then the approach that I modeled in my lecture might be of use to them; if so, then we’d have some things in common (e.g., curiosities, hunches, problematics, and tools) and thus we’d have not just something to talk about but, more importantly, some way of talking about things that caught our attention. I realized at the time that my answer was completely unsatisfactory to this professor, who, I later learned, was a philosopher of religion very much interested in interreligious dialogue (hence the focus upon truth conditions, I assume). His question, therefore, put squarely on the table a dramatic difference in our approaches, for while he was keen to argue over whether what I had said was true or not, I dropped by Calgary—to paraphrase Michael Newbury’s song, made famous by Kenny Rogers and the Fifth Edition in 1968—to see what condition our truth conditions were in. That is, I was and remain interested in so-called meta- questions, trying to figure out how groups establish and manage the parameters that enable their members to distinguish true from false, allowable from unallowable, original from subsequent, center from periphery, desirable from undesirable, safe from dangerous, pure from impure, authentic from fake, even sacred from profane, all of which assists them to distinguish and then police the limits of some posited Self, in distinction from Other. Thus, it’s not a matter of truth or falsity, for as Emile Durkheim made clear so long ago, religion—or in my case, use of the category “religion” itself—is neither true nor false but, instead, a brute fact of some people’s social lives. And looking at it in this way may help shed some light on how it is that groups who use this designator (or any of its attendant tropes) as part of their larger Self/Other folk taxonomy are able to draw and, despite the unpredictability of their contingent historical conditions, apparently maintain the sense of boundaries that make it possible for their members to distinguish such things as true from false and member from non-member. It should be clear, then, that despite both of us being physically positioned in the same room, employed in the same academic field, the intellectual positions that marked my questioner and myself were quite far apart. The distance between his interest in truth and my own interest in utility is, I think, indicative of how far the field has traveled over the past several decades—a distance nicely represented by three scholars who, despite constituting three different academic generations, all happen to have shared the same institutional setting at the University of Chicago. I have in mind the difference between, on the one hand, Mircea Eliade’s influential studies of the sacred, conceived by him to be a universal structure of human consciousness, manifesting itself in the historical world first here and then there, and in the process inserting timeless value and meaning into the otherwise turbulent and meaningless historical world, and, on the other, both Jonathan Z. Smith’s far more ethnographically controlled work on such topics as anomaly, incongruence, and choice, all aimed at determining how significance is fabricated in discrete situations, and Bruce Lincoln’s equally careful case studies of human contests over authority and legitimacy in settings where it might all be up for grabs. Despite all three being enviably skilled comparativists carrying out much of their most important work at the same institution (though not necessarily in the same unit, of course), there are profound differences between what we might as well call the earlier and the later Chicago school. Although Smith’s and Lincoln’s work are hardly identical (and for the time being I leave it to others to tease out the differences), and although these two representatives hardly exhaust the sort of scholarship on religion currently being carried out either at that institution or by its more recent graduates, they do share in common an unapologetic emphasis not on the sacred, as with a previous generation of historians of religion hailing from the Windy City, but on people (or at least the artifacts left by people) who are busy working out relationships of similarity and difference (i.e., identity) in specific moments, using a variety of techniques, some of which scholars have assigned the names of myth and ritual. Although I wouldn’t want to make them responsible for things that I happen to find interesting, I can at least say that it is because of the work of people like Smith and Lincoln that current scholars can make the shift from studying religion or faith or spirituality or experience (whether pursuing studies of their history, meaning, or cause) to studying the socio-political work being done by the classification “religion” itself. 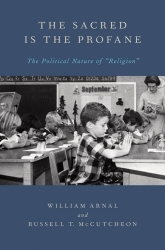 Working in this alternative tradition in the study of religion, the essays that my friend, Bill Arnal, and I collected together in The Sacred is the Profane: The Political Nature of “Religion” (a few published there for the first time) try to chart some of the developments in how we study this slippery designator. I say slippery because the category religion, used everyday by countless human beings either in the Euro-North American world or those peoples impacted by its exported socio-political and economic systems, is widely understood by most to defy definition; and it is precisely this defiance that makes “religion”—an ancient, Latin-based category but one that was retooled beginning in the early modern period—a remarkably resilient conceptual anachronism. Its resiliency results from its ability to assist social actors from all across the political continuum to grapple with the effects of ad hoc social conventions, contingency, and unpredictable circumstance, thereby allowing them to get on with the business of actively engineering their social worlds while appearing to be doing nothing but acting out universal self-evidencies that are said to reside deep in the marrow (whether in the head—inasmuch as religion is thought by some to be about rational belief systems—or in the heart—inasmuch as religion is said by still others to be about non-rational feelings, experiences, and sentiments). The category “religion” is therefore a highly effective technique—a versatile little problem solver, I once called it—that we use to collapse the inconvenient gaps that are sometimes so apparent when confronting the proverbial Other, with interests contrary to our own, in the midst of each contingent situation; it’s somewhat equivalent to the common linguistic and behavioral conventions that we so easily slip into those awkward silences: lacking specific content, saying “Uh-huh” can create the impression of interest, affinity, and therefore unity. But such devices work because they strategically miss much; just as Ernest Renan once said, in an 1882 public lecture, that the idea of the nation was founded on forgetting, so too such rhetorical devices (whether verbal or behavioral) allow us to overlook the inevitable inconsistencies of historical existence, like the affirmative head-nodding that greets the rhetorical question, “Know what I mean?”—a behavior that can happen despite head-nodders not having had time to decide if they have the foggiest idea about what someone is saying or whether they even care to find out. Such seemingly mundane socio-rhetorical conventions—and I would place using the category “religion” to name and thereby isolate part of our social world, among these commonplace techniques—nicely gloss over, at countless social sites, such things as our possible misunderstandings, disagreements, competing interests and, at times, our outright boredoms; they perform the crucial task of greasing the wheels of our inevitably disjointed social worlds, allowing us to represent ourselves, both to ourselves and to others, as a specific sort of self, as a member of a seemingly unified “us,” going in a specific direction for a specific purpose—thereby enabling people to experience themselves as inhabiting a particular subject-position, to the exclusion of its many competitors. And, in so doing, it helps us to make it through yet another day spent in close quarters with people we may find either uninteresting or rather bothersome. Russell McCutcheon is a Professor in the Department of Religious Studies at the University of Alabama. Interested generally in issue of theory in the study of religion, and specifically in the social and political utility of the very term “religion” itself, he has worked at three different public universities in the US. He came to Tuscaloosa in 2001 to be the Chair of the Department, a role he played until 2009 and which he will again take on in the Summer of 2013. He teaches a variety of courses in the Department, on such topics as the rhetoric of religious experience or authenticity, and continues his research on such topics as religion and modernity. He also has a dog, Izzy.